The BPDA Calculator App is now available on your App Store. This calculator App has been developed to optimise the structural design and material cost of your underground sewer pipeline system. This calculator is designed to help you estimate the material cost (bedding, infill material and pipes) for installation pipes using different bedding designs. 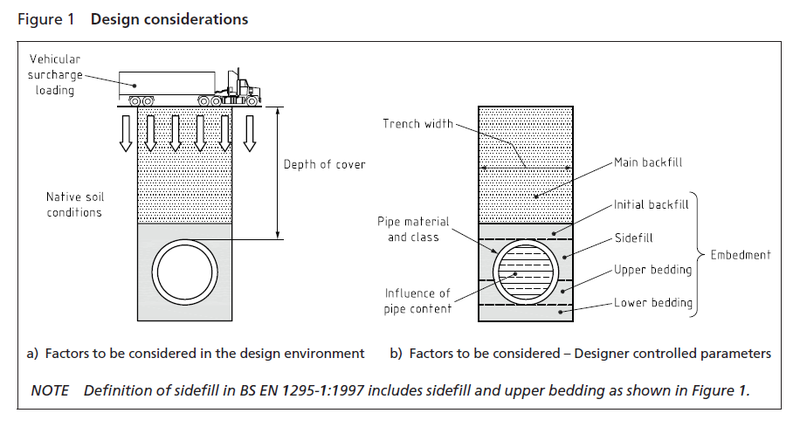 The calculator compares four classes of bedding for rigid concrete pipes and the single bedding class usually used for flexible (plastic) pipes. The load bearing capacity of an installed pipeline relates directly to the construction of the bedding which is intended to level out any irregularities in the formation, and provide uniform support around and along the length of the pipe barrel. The strength of an installed pipeline depends on a combination of the strength of pipe and the class of bedding. The selection of the bedding class is influenced by many factors, which include the nature of the ground, the loads acting on the pipeline in the trench, the strength of the pipe, and the local cost and availability of the bedding material. Cost of pipe (per metre run) – including gaskets, connectors etc. If not integral to pipe. Cost of transporting excavated material from site and disposal cost to landfill (per tonne). Unit cost of bedding used (per tonne). Bulk density of excavated material and imported granular bedding (tonnes per cubic metre), if known. Default values of 2.0 for excavated material and 2.2 for bedding are assumed. The nominal diameter of a pipe is generally determined by its internal diameter. The calculator compares the nominal diameter of a concrete pipe with the equivalent nominal diameter of a plastic pipe. Where the equivalent nominal diameter of a plastic pipe is not the same numeric value as the concrete pipe, the calculator will up-size the plastic pipe to the next available nominal diameter, thus ensuring that the hydraulic design is not compromised. The figure used for outside diameter (OD) is based on the mathematical mean for a range of different pipe manufacturers standard products. For concrete pipes, the range is based on BPDA member companies. For plastic pipes, the mathematical mean includes both solid wall and structured wall pipes. Trench width is based on the medium trench widths as per TRRL Simplified Tables. Bespoke products fabricated to other sizes may be available on request, but have not been included in the calculator. Contact BPDA member companies for details.